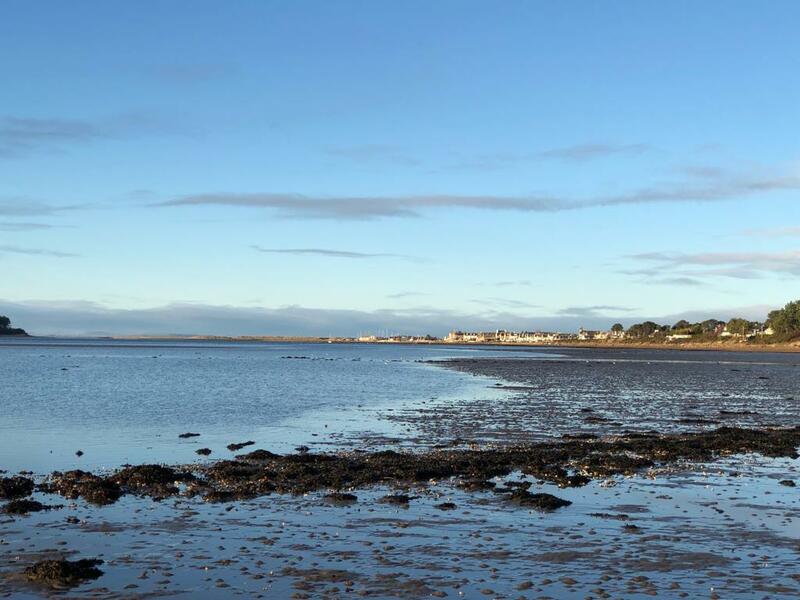 Slowly people come back to Findhorn filled with their experiences from Christmas break. With the group almost complete we start the Permaculture Design Course, continuing with what we have been starting with before the break. 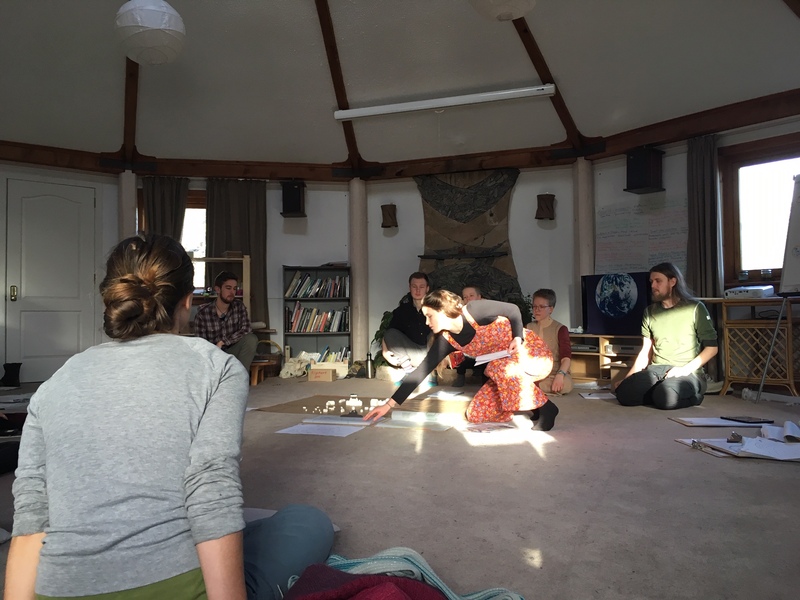 We dive in again into the Permaculture Ethics starting the week with People Care having a day of acknowledging our feelings about how it is to come back, which might be very diffrent from person to person. Also practising some of the Permaculture Principles we Obtain the Yield and harvest some vegetables and herbs in Craig’s and Maria’s garden at the whiskey barrel house for our tea break. Maria is contributor for the Permaculture course and visiting her and Craig’s place and their Permaculture garden is time and again part of the course content. The rest of the day we sing and dance as well as caring, holding and unfolding each others bodies. 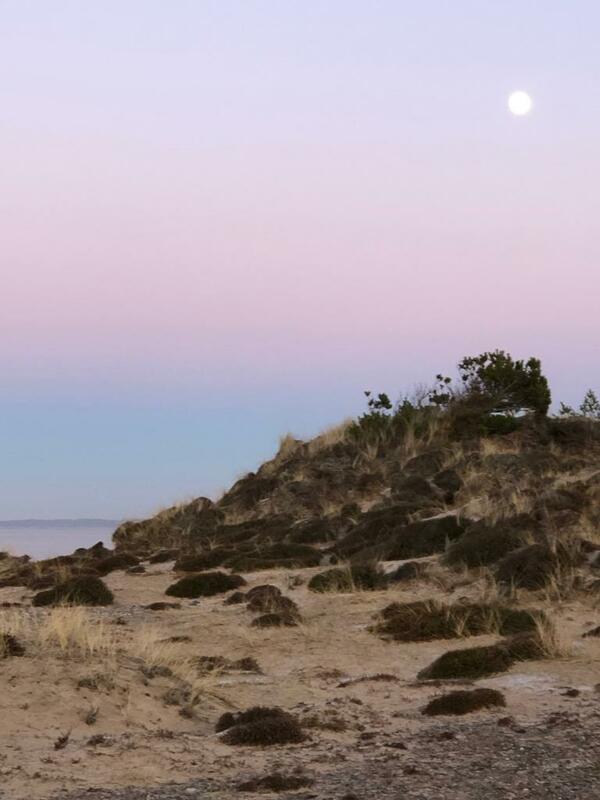 The following days we learn about trees in Permaculture and how to prune them, looking deeper on the Principles and Design Frameworks, making a landscape tour around Findhorn and having a presentation about Permaculture in a small business. The whole week gave us detailed insights in specific areas of how Permaculture can be used and what its underlying structure is based on. That was sometimes confusing or challenging but still very interesting and inspiring to get all these bits and pieces which together form a bigger and very diverse picture of Permaculture. The second week went on like the first. We looked at many different things each for one morning or aftenoon and sometimes a whole day. We practised our observation skills in nature, learned about water systems and more about the Living Machine, which is doing the cleaning of the grey water in the Findhorn Foundation. 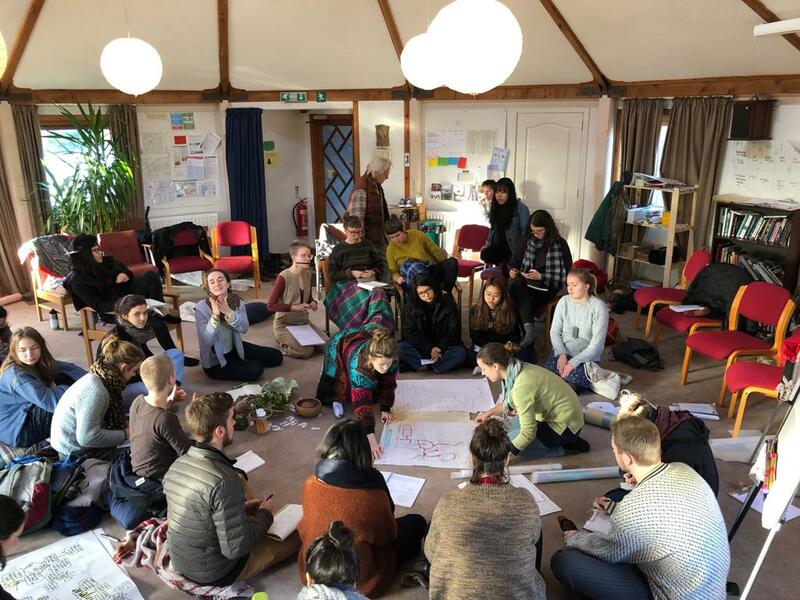 We dealt with Permaculture in social systems, in general but also particularily with our group, did reflection on the course so far and voiced what needs we have (for the course and in general) what we can do about it ourselves and what we need from the group and the contributors. We had a great session were we looked in detail on Maria and Craig’s garden and how Maria’s design process was for this piece of land which we already visited quiet a lot. We learned about herbs and wild food and made some very nice comfrey balm and a detox ticture. The last thing for this week was how building (houses) can be looked at from a Permaculture perspective and how to integrate them in a Permaculture system/garden. The week was a lot of information again and we were very ready to get started with our design challenges in the following week and to intergrate as much as possible of the things we learned. Before we got started we had a great excursion to two different Permaculture projects around Findhorn. It was very inspiring to see how people start their own projects to become self-sufficient and sustainable fr themselves and their surroundings. The design challenge started on Tuesday afternoon and went on for two and a half days. After spliltting up into five groups with five projects we really dived into the different stages of Permaculture Design. My group was working on a design for the Original Garden (where the Findhorn Community started). The design was focussed on making the Garden more self-sufficient and catch and store energy especially water. 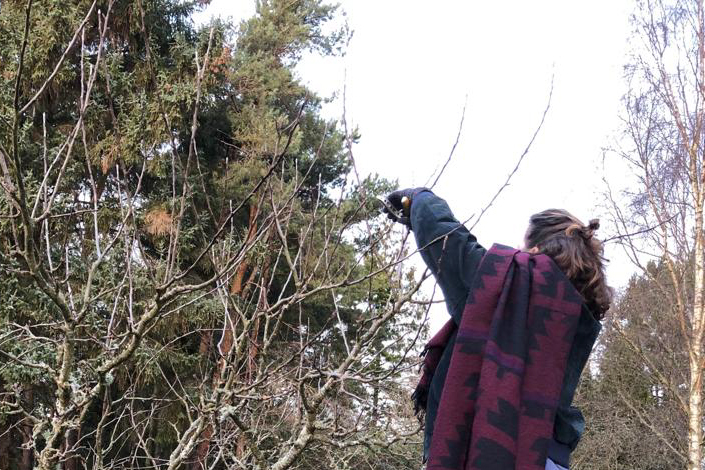 We started with surveying and creating a base map, going out and observing and collecting all information we could get from the sight as well as from our client Daniela who is responsible for the Original Garden in the Findhorn Foundation. After starting very stuctured following the stages of design framework of Ga.S.A.D.(I.M.E.T. ): goals articulation, survey, analyse, design/decide, (implement, maintain, evaluate, tweak) we moved to a more chaotic and many-things-at-the-same-time-mode. But that wasn’t less productive. We were a group of six people so almost always we split up into smaller groups for focussing on a specific topic, e.g. the water system, more edible plants, finishing maps… It was a very harmonious process. One goal of the group was to focus on people care in our design process because we still had a lot of work to do for Initiative Forum and to do everything at the same time was very challenging. But in the end we finished our design project satisfying for us and the Original Garden team.